As the weather warms up and the weeks pass, your kids might be counting down the days until summer vacation with jittery anticipation. Like other seasons, summer especially can require extra accommodations when leaving the house – sunscreen, hats to protect faces and heads – but one of the most important is carrying water in order to stay hydrated. 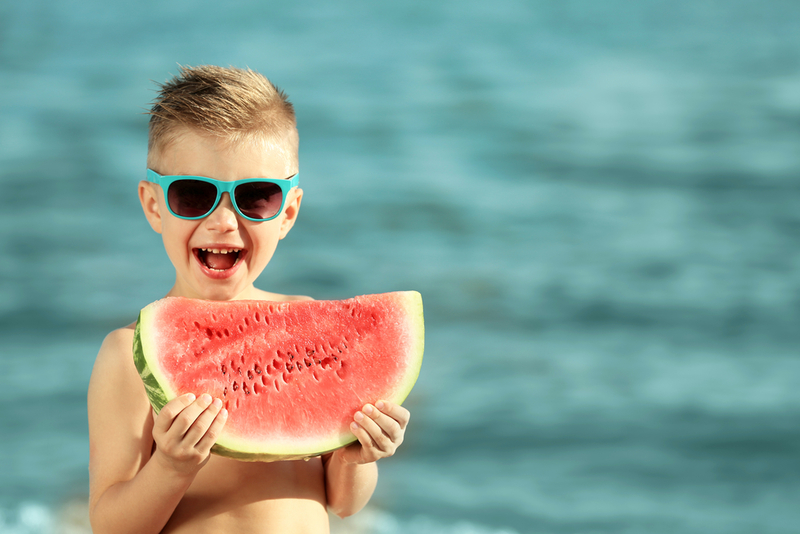 Kids’ bodies have a higher metabolism and do not cool off as efficiently as adults do. Not only that, children are typically caught up in activities or playing to even realize they’re thirsty until they’re already significantly dehydrated. This is why it’s important to get them in the habit of drinking fluids consistently. Studies show that proper hydration can even begin with a morning meal or the night before if you are anticipating a hectic day ahead. A large glass of water with dinner or breakfast can be effective, but it’s also a commonality that kids prefer sweet and flavoured beverages over water, and drink up to 90 percent more when it is offered to them. If this seems to be the case with your child, stick with Gatorade and other drinks high in electrolytes – juices or soda can actually lead to a faster dehydration. If your child exudes one or more of these obvious symptoms, seek shade or an air-conditioned room immediately. Once they are out of the sun and begin to rehydrate, contact a medical professional right away and they will probably require you to take your child to a nearby clinic or urgent care to be examined. Severe hypothermia (heat-related illness), can be defined as a body temperature at 104 (40 celsius) or higher, which can be lethal. Less critical issues can be similar conditions like heat exhaustion or heat cramps; and while these are not considered a medical emergency, they can spiral into sun stroke if not treated. Remember, all of this can be avoided if the proper precautions are taken. 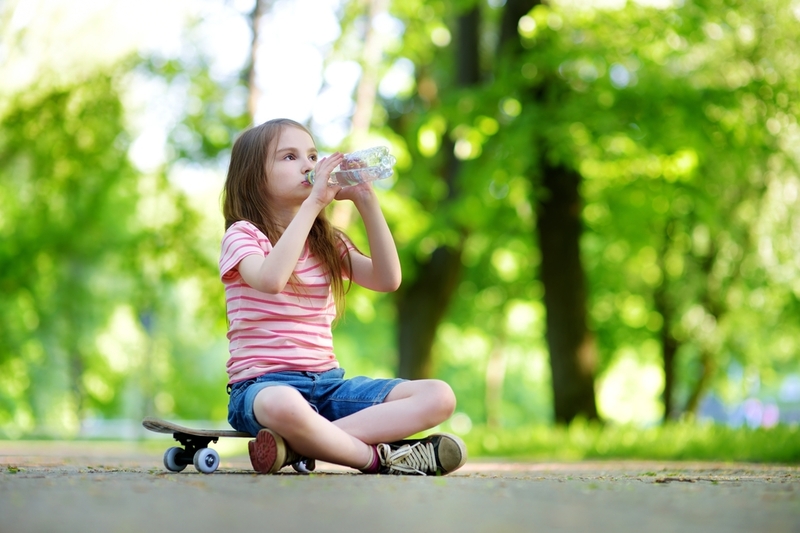 The AAP suggests 5 ounces of water every twenty minutes (just a couple sips) for an 88 pound child and 9 ounces for kids and teenagers up to 123 pounds. If this seems like a lot of water breaks, try offering a popsicle to your kid instead. Diet can also play a factor – fruits and vegetables are loaded with not only vitamins and minerals, but contain water as well. 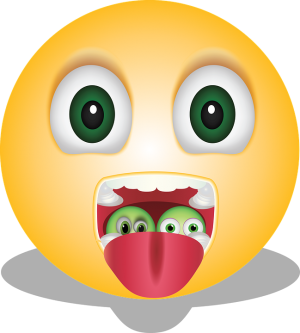 Eating foods high in water content can reduce the need for frequent (five times an hour) water breaks, although this does not mean drinking water throughout the day should cease being a habit! Let’s be real here, parents. 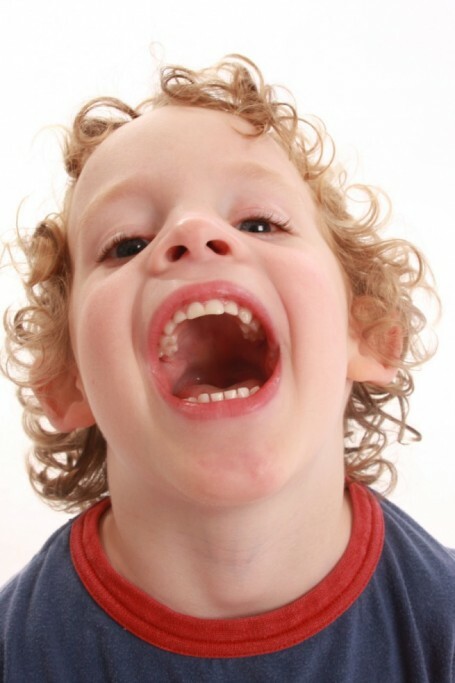 Kids can be really hard on their teeth. 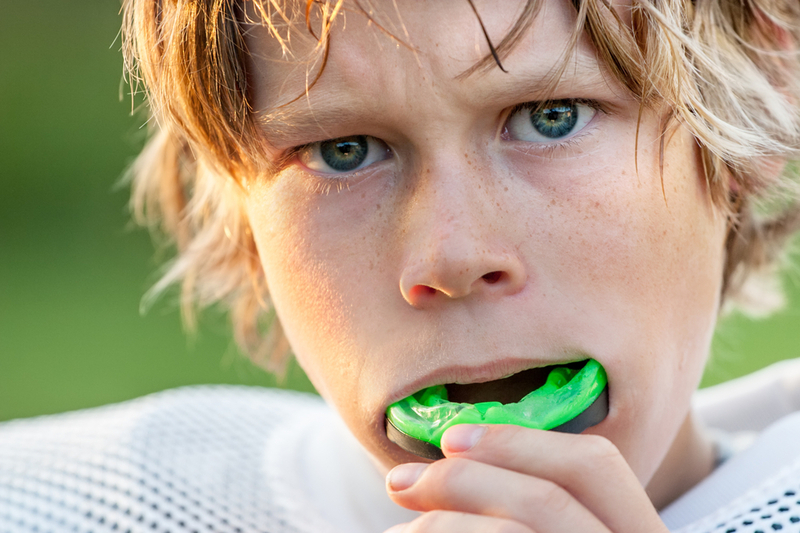 If the dentist knows your child is in sports (particularly contact sports) there is a high chance they have recommended a mouth guard for your child to use during practices and games. We know, we know – mouth guards can be pricey, especially if it is one that is custom-molded. But they can be well worth the investment when you consider how much future damage the device could be preventing. 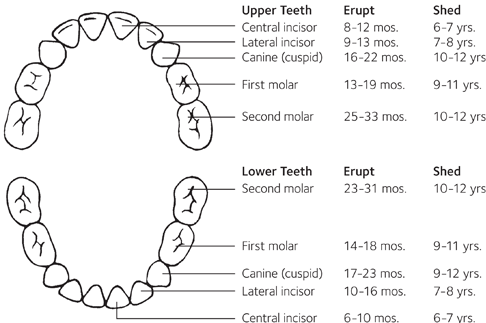 Its purpose is to minimize and force that could be exerted on to the teeth, jaw, or gums, either by clenching or by an outside source. Accidents happen, especially in combat sports! Getting hit in the face by a ball or being struck by another athlete by mistake is sometimes just a part of the experience. Taking steps to ensure your child’s mouth is safe is just as important as knee pads or a helmet. 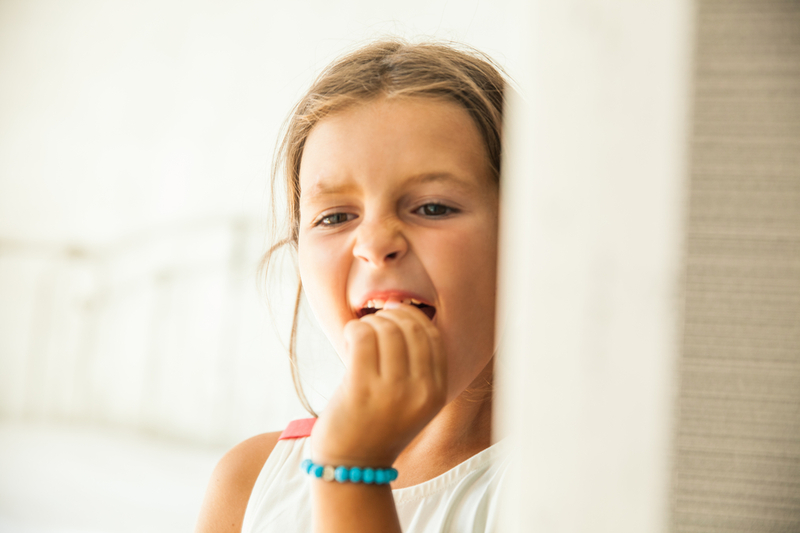 But just the use of a mouthguard is not enough – it is making sure your child is properly maintaining it – not just so it can be used long-term, but also so that it doesn’t become a breeding grounds for bacteria. When a mouth guard becomes worn, the edges can begin to deteriorate. 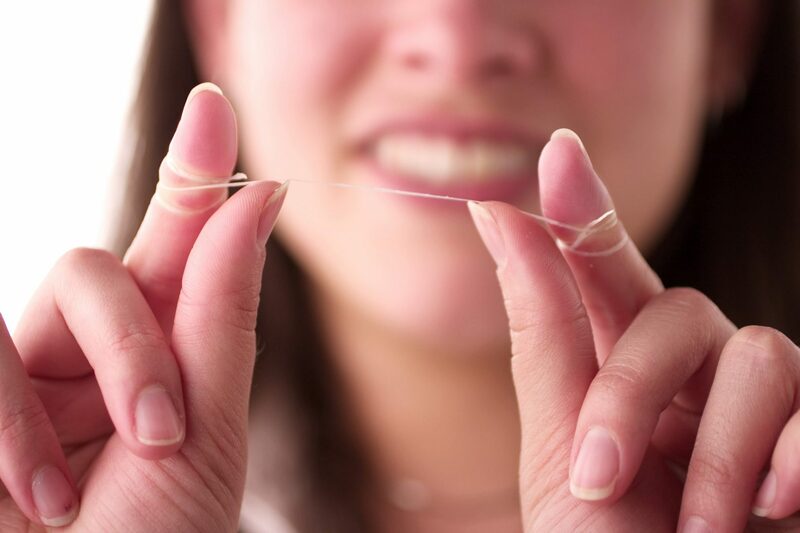 The rigidity and roughness can cause small abrasions in the gums and lead to infections. 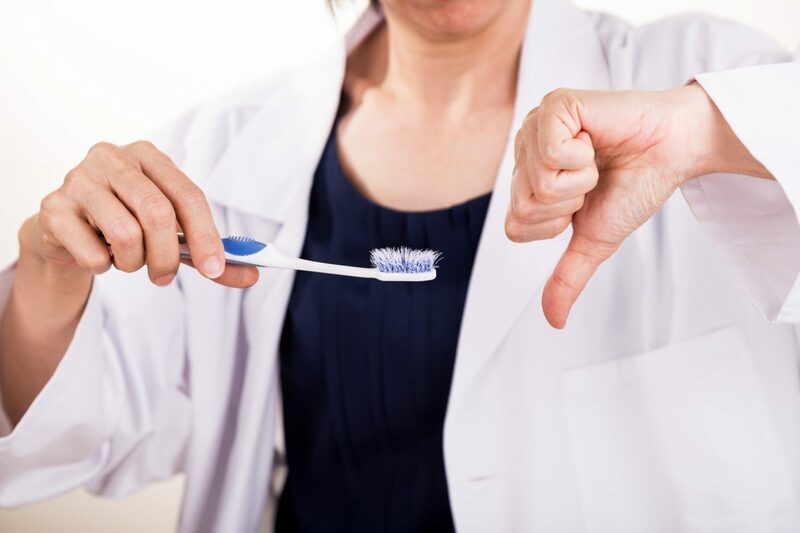 The reason why this is different than nicking yourself with a toothbrush is that yeasts and molds could potentially be living on the device depending on how frequently it is cleaned and where it is stored. The General Journal Dentistry ran some tests on young sport’s players mouth guards. On one belonging to a junior high football player, the same bacterium found in an infected leg wound was discovered. Similarly, a hockey player’s guard got so contaminated with mold (five different kinds), that his exercise-induced asthma was triggered and worsened to where his inhaler was not capable of keeping his symptoms at bay while competing. 4. Make sure the container the mouthguard is stored in is sanitary and has some holes for air circulation. If the moisture inside is air-tight it can cause mold to grow. 5. To ensure the mouthguard does not get warped and keeps its shape, do NOT boil it in hot water to clean it or leave it out in the hot sun! 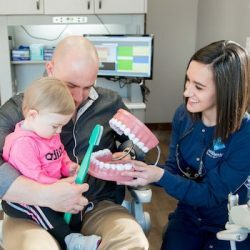 Talk to your child before investing in a mouthguard and share with them not only the benefits of wearing one, but the importance of taking care of it. 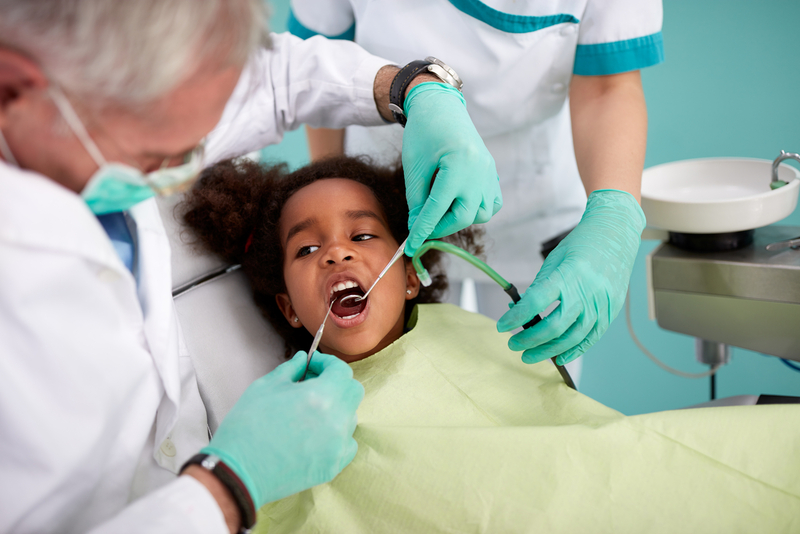 Together, you can make sure your child is getting the most use out of it and protecting their beautiful smile! 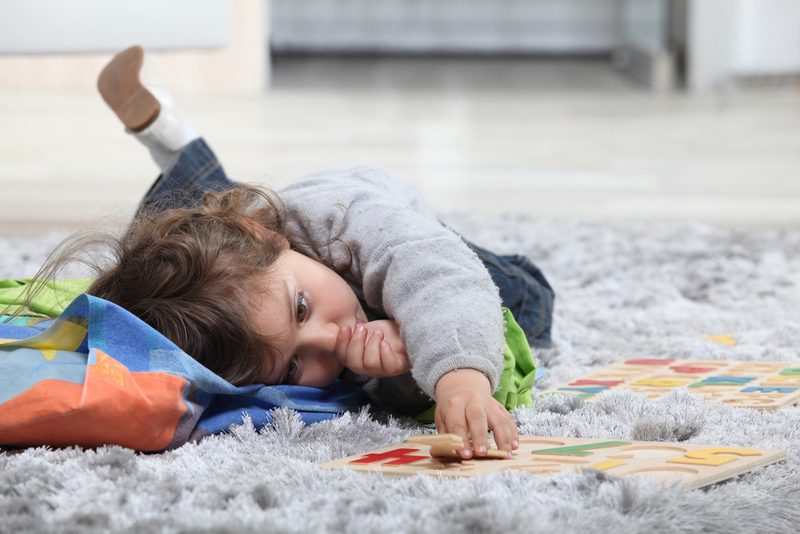 Toddlers needing sleep is a no-brainer. A newborn sleeps anywhere from 16-17 hours a day, and as they grow older still require over 10 hours. This is a necessary amount for their mental, emotional, as well as physical growth. However, studies show that naps aren’t just for little kids. People of all ages can greatly benefit from this practice. In much of the world, particularly Latin America, they have what is called “siesta”, which is loosely defined in Spanish as an afternoon power nap. It is commonplace in many of these countries, even places like Portugal and Spain, to take a short rest in the middle of the day as a societal practice. Businesses close and then re-open to prepare for a second rush. Some people say it is due the intense heat that occurs at midday around this time; although it could be that coupled with the consumption of the most filling meal of the day at lunchtime. Sounds nice, right? Latinos are not the only people group that have adapted this. In Japan, they are beginning to implement what are called “sleep salons” where individuals can take a power nap if they need to. Japanese schools – even high schools – are also beginning to integrate a 15 minute afternoon nap, mandatory for all students to increase alertness. In China, their midday rest is so ingrained in their culture it is seen as a Constitutional right. Did you hear that? Chinese adults all over the country view taking a nap in the middle of the day as important as paid leave, or health insurance. Sadly in United States, napping is often viewed as indulgence and even laziness. The only city known to incorporate a napping policy has been seen in a few companies in New York city, but that is it. Yet – we are considered one of the most fast-paced, stressed out, and sleep-deprived countries. Putting it in perspective, it’s rather shocking. How would one get a restful sleep in the constant chaos of American hustle and bustle? Many recommend short naps, anywhere from 15-20 minutes. The reason for this brevity is because after a certain length of time our bodies can slip into a deeper sleep, making it more difficult to wake up and can even leave you feeling more tired than you were before. This is why children, who require more sleep than adults, nap over an hour at a time because it allows the child to cycle through this deeper sleep before they wake up. Have trouble falling asleep? You are arguably one of many thousands of people who claim they are unable to have a midday catnap! However, science would argue and say that every single individual is capable of napping, it is just up to the person to determine what would distract them from doing so and the mental barriers that would need to be removed in order to gradually enter into sleep. Experts suggest that you do not nap any closer than three hours to your bedtime, and try to wait at least a few hours after you wake up. It is recommended to cover your eyes with a mask or make it so there is little to no light getting into the room you are in. Also, eliminate sound the best you can and discover what relaxes you. Some use essential oils or calming music or sounds such as ocean waves. Set your alarm for 25 minutes or so, depending on how long it typically takes you to fall asleep, so that you will not exceed 20 minutes. If you are a stay-at-home mommy (or daddy!) 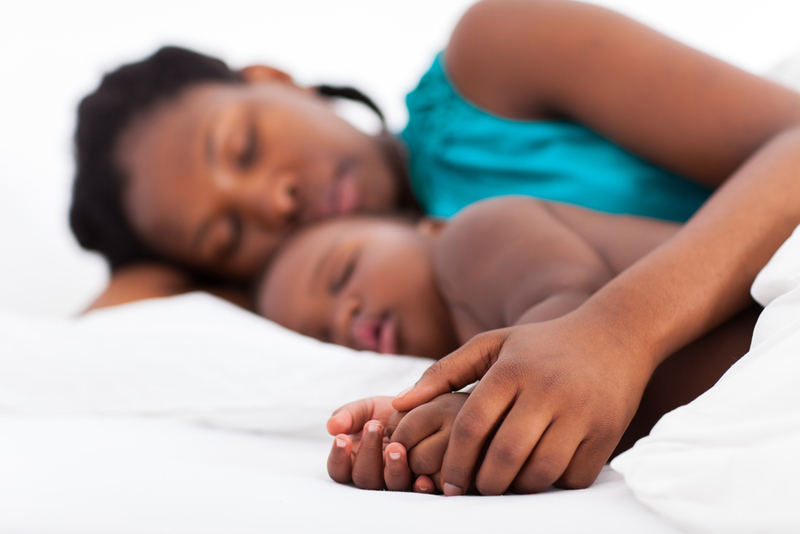 with a toddler who only requires about one nap a day, the best advice often claimed is to “sleep when they do!” Afternoon naps can be a source of bonding between you and your child, and can leave you both feeling rejuvenated. A recent report said that an adult will spend an average of 7 hours a day on the internet. When we examine social media and search engine traffic, this statistic seems not so surprising. Living in these digital times, people of all ages can become mesmerized and enticed by scrolling and tapping on a personal device; killing hours of time for any number of reasons. Millennials then are faced with a challenge, as children are even more easily hypnotized and pacified than adults. If parents need quiet or a distraction it can be easily remedied by simply handing over a device, keeping a child occupied for up to hours at a time. Momentarily this seems like a quick-fix, and each and every time it becomes harder to withhold and to say no. Don’t panic – we’ve all done it, and we aren’t here to pass judgement. 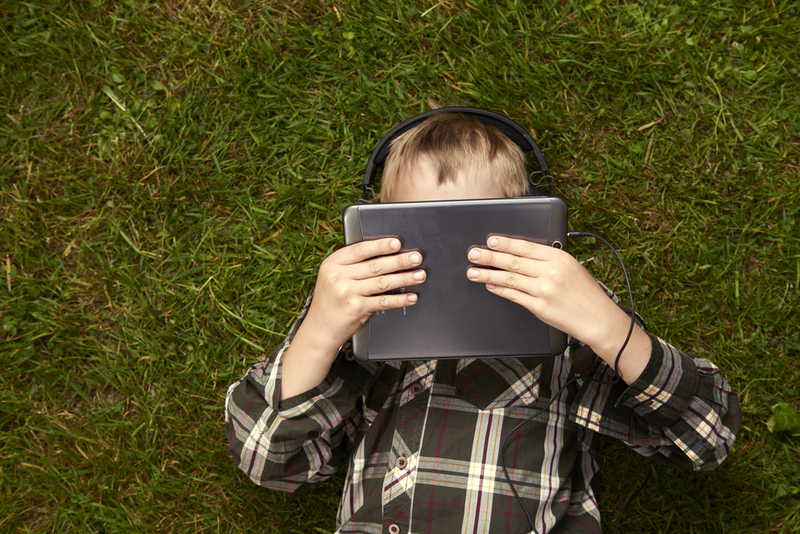 We just want to share facts about enabling excessive iPad, iPhone, and tablet use for kiddos. A lot of times children’s games and videos on mobile devices are designed for to be educational. This is not a negative thing. The problem is not that screens themselves are dangerous, but that they are addictive to adults as well toddlers all the way up until high school age. Remember how your mom never let you sit too close to the TV? Maybe she or your dad limited your viewing time to two or three episodes a day? Mobile device usage is a double-whammy in this respect. It is always held within a few inches to the face, blocking out everything else and completely diminishing the surrounding environment. Remember that tablet games are also interactive, meaning that it require s active participation from the child and therefore seizes their attention far more than television does. Dr. Aric Sigman from the British Psychological Society says that when small children become pacified in this way, it creates the opposite affect of what you desire to occur without the device: the skills to engage with others and be entertained without relying on a screen. Screen time too early in life “is the very thing impeding the development of the abilities that parents are so eager to foster through the tablets. The ability to focus, to concentrate, to lend attention, to sense other people’s attitudes and communicate with them, to build a large vocabulary—all those abilities are harmed,” Sigman says. The exact psychology behind this is extensive, but at least one aspect of it can be explained quite simply. Children are far more impressionable than adults and during development their minds are hypersensitive to their environments. When the brain is overstimulated repeatedly over a series of months and years, simpler activities like coloring with crayons or playing outside do not satisfy the mind because these activities are not as complex or entertaining. Upon discovering it is not as stimulating, boredom kicks in faster and so does the eagerness to return back to the mobile device. Therefore, prolonged screen-time can desensitize the want to play outside, exercise, and use imagination; all critical aspects of both physical and mental growth. Remember when you got a yo-yo, and it was the coolest thing in the world, but then at one point you discovered video games, and the yo-yo collected dust on the shelf for the rest of its life? It’s like that, only a continual, cycling complex. How is this remedied? Well, the simple answer is just to limit use or to not introduce it at all until the child is older. However, if you are wanting to still actively use mobile devices in your home, here are a few ideas we’ve cooked up to use as alternatives. 1. The next time you are in the car longer than a few minutes, encourage to make pictures in the clouds outside the window. 2. Play I-spy, by describing an object along the road and having your child guess what it is. 3. If they are old enough to read, try the alphabet game. That means start with looking for objects that start with an A, then B, etc. 4. Choose one day a week where there is absolutely no screen-time. Play outside or visit family and friends. Explain that this is just one day, and be consistent with th e habit. This means no screen time for parents either, other than talking or texting when necessary, so as to set an example. If you feel this to be too daunting, instead remove screens at least 90 minutes before bedtime and ask all your children to turn in their phones and devices. This will help everyone in the family sleep better, too. 5. If a child is stubborn and resistant to these ideas, change the passcode on the device. Tell them after an hour of outside play, chores, or any other activity you chose you can give it to them when they have completed the given task. We hope these ideas are helpful and assist you in cultivating healthy and attentive young minds! To read more on this topic, click here. Spring has sprung! With the long winter behind and warm weather ahead, now is the time kids will start playing outside more and more. Why not show them an outdoor hobby that could be a valuable skill for the rest of their life? Gardening and landscaping are a great skill set to have because both are great for recreational and commercial purposes. Whether you already grow your own vegetables, herbs, or maybe have only a few plants around the house, having greenery near or inside the home has proven benefits. 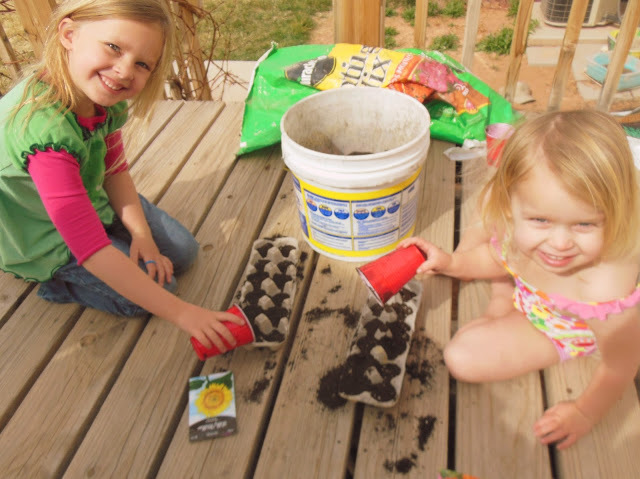 Cultivate the interest with your children now – they may just have a green thumb! Egg cartons make excellent containers for soil. They are just absorbent enough to prevent the dirt becoming waterlogged. Simply pour soil in the carton so that it is about half-full (enough to still see the dividers that go between the eggs). Place the seeds on the top soil, and gently press them in (depending on the seeds you buy, it may say on the packaging to plant slightly deeper). Then water the soil thoroughly. When the carton appears to have mostly dried, wrap plastic wrap around the carton. This creates a “greenhouse” effect because moisture stays in the soil longer. This means the seeds will not have to be watered again until after they have sprouted. The greatest part is that egg cartons fit most standard window sills, so they can get as much sun as possible. What is more, if it gets knocked over there is no mess! 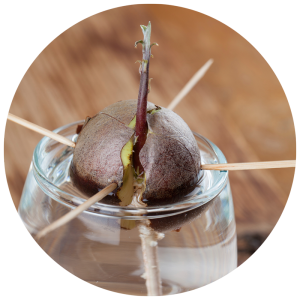 Take an avocado pit and let it dry out for a few days. Then, take three toothpicks and poke them on all sides of the pit to suspend it over a cup of water. This is particularly neat for kids to watch because it does not take long to see sprouting out the top! Make sure it is not submerged but that the water comes up at only about half. 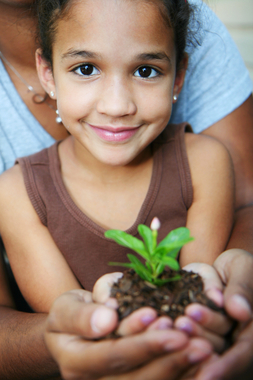 Once the pit has sprouted, pot the plant in fresh soil and watch it grow! Terraniums are fun, beautiful, and you do not have to wait for them to grow – this might be a good idea for kids who are easily bored or impatient! This particular terranium can be completed for under 15 dollars in less than an hour! Start off with a large jar or fishbowl – any glass container that has an easily accessible top. From there, buy two or more small plants or herbs you’d like to put in the terranium. Either find some gravel from around your yard or go out and buy some, and place it at the bottom of the jar. Next, you’re going to want to separate the soil from the gravel. This can be done by using the mesh bags similar to the ones gravel or fish rocks come in. If you did not have to purchase either of these items, other mesh materials like pantyhose will work. From there, pour the soil on top so that water can go through but soil does not get trapped in the rocks. This is because a glass bowl is impermeable, and the plants will drown if there is no draining system. If you would like to add moss, it can be found in sidewalk cracks, trees, or perhaps other areas of your backyard. While it is not mandatory, it really brings the whole look together. 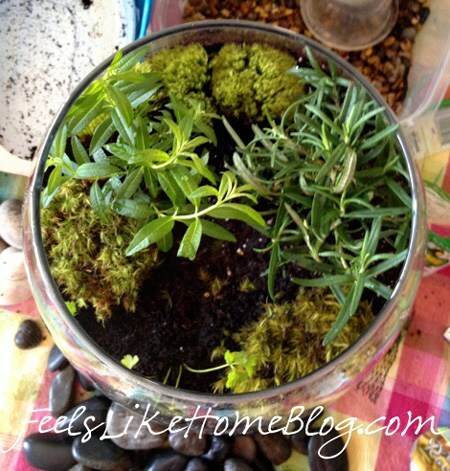 Before placing the moss into the terrarium, be sure to soak the dirt side in water so that the soil can bond together. Before planting, try a few arrangements to see what would look best. Once you have planted them, be sure to water them right away and then add decorations if desired (rocks, shells, etc).